Mike Greene - mgreene@shawmedia.com Prairie Ridge's C.J. Eikum watches his clearence while competing in the high jump finals at the Boy's IHSA Sectional Track and Field Meet Thursday, May 17, 2012 in Rockton. Eikum took second place in the event with a jump of 6 feet 3 inches. 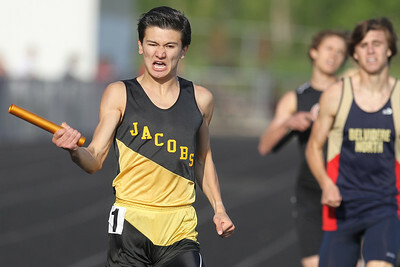 Mike Greene - mgreene@shawmedia.com Jacobs' William Hennessy celebrates after taking first place in the 4x800-meter finals at the Boy's IHSA Sectional Track and Field Meet Thursday, May 17, 2012 in Rockton. Hennessy and Jacobs took first place in the event with a time of 7 minutes 51.76 seconds. 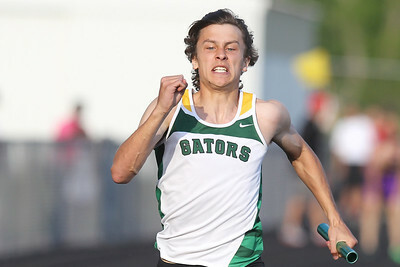 Mike Greene - mgreene@shawmedia.com Crystal Lake South's Zane Boettcher powers through the last leg of the 4x100-meter finals at the Boy's IHSA Sectional Track and Field Meet Thursday, May 17, 2012 in Rockton. 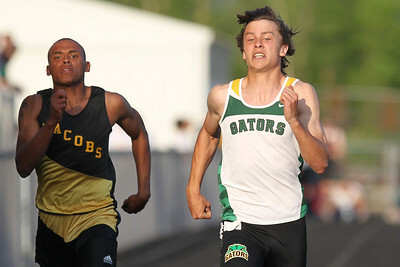 Boettcher and Crystal Lake South took first place in the event with a time of 43.24 seconds. 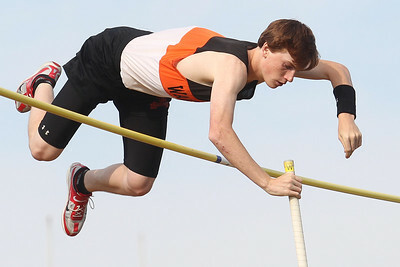 Mike Greene - mgreene@shawmedia.com McHenry's Nate Richartz momentum stops momentarily while competing in the pole vault finals at the Boy's IHSA Sectional Track and Field Meet Thursday, May 17, 2012 in Rockton. 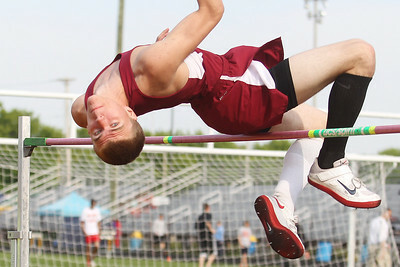 Richartz took first place in the event with a jump of 14 feet 9 inches. 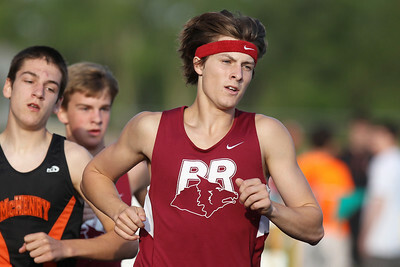 Mike Greene - mgreene@shawmedia.com Prairie Ridge's Mitch Wilkins runs in front of McHenry's Jesse Reiser (left) and PR's Joe Cowlin during the second heat of the 3200 meter run finals at the Boy's IHSA Sectional Track and Field Meet Thursday, May 17, 2012 in Rockton. Wilkins took third place in the event with Reiser taking second and Cowlin finishing fourth. Mike Greene - mgreene@shawmedia.com Huntley's Justin Herbert winds while throwing in the discus finals at the Boy's IHSA Sectional Track and Field Meet Thursday, May 17, 2012 in Rockton. Hertbert took sixth place in the event with a throw of 140ft 10in. 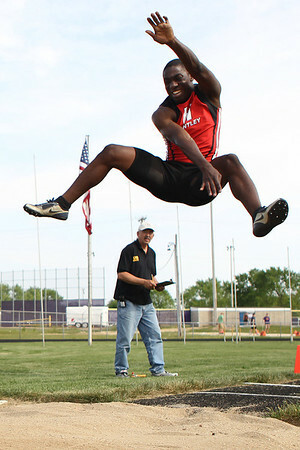 Mike Greene - mgreene@shawmedia.com Huntley's Cj Ayemoba jumps in the third flight of the long jump finals at the Boy's IHSA Sectional Track and Field Meet Thursday, May 17, 2012 in Rockton. Ayemoba scratched on all three atempts. 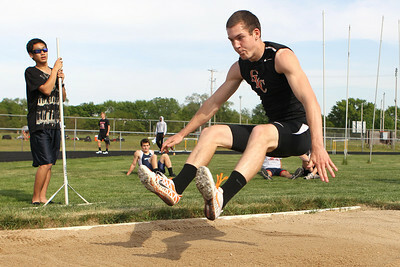 Mike Greene - mgreene@shawmedia.com Crystal Lake Central's Isaih Mosher jumps in the third flight of the long jump finals at the Boy's IHSA Sectional Track and Field Meet Thursday, May 17, 2012 in Rockton. Mosher took third place in the event with a jump of 21ft 3.5in. 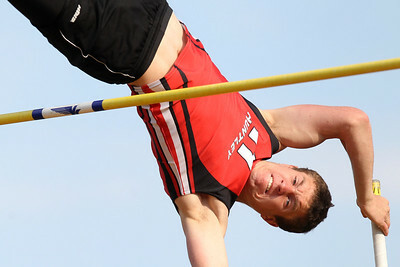 Mike Greene - mgreene@shawmedia.com Huntley's Ryan Sheehan attempts a jumpt of 14ft 3in while competing in the pole vault finals at the Boy's IHSA Sectional Track and Field Meet Thursday, May 17, 2012 in Rockton. Sheehan missed the jump, but finished in third place with a jump of 13ft 9in. 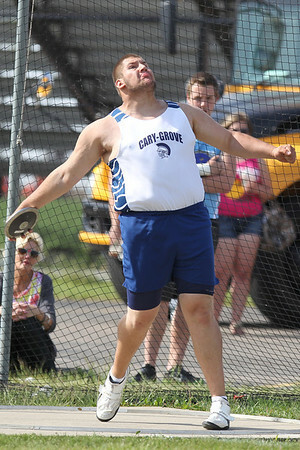 Mike Greene - mgreene@shawmedia.com Cary-Grove's Josh Freeman prepares to release a discus while competing in the discus finals at the Boy's IHSA Sectional Track and Field Meet Thursday, May 17, 2012 in Rockton. Freeman took second place in the discus with a throw of 170ft 5in. Freeman took first place in the shot put with a throw of 60ft 11.75in. 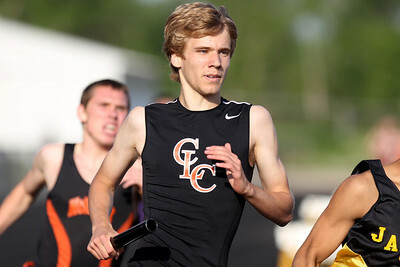 Mike Greene - mgreene@shawmedia.com Crystal Lake Central's Alex Baker runs in the pack during the 4x800-meter relay finals at the Boy's IHSA Sectional Track and Field Meet Thursday, May 17, 2012 in Rockton. Baker and Crystal Lake Central took third place in the event with a time of 7 minutes 53.13 seconds. 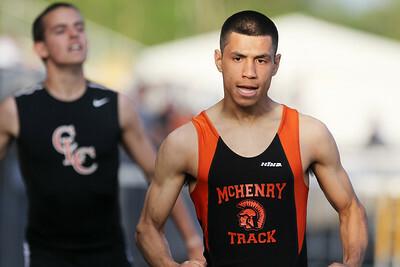 Mike Greene - mgreene@shawmedia.com McHenry's Gilbert Matias celebrates after competing in the 110-meter hurdles finals at the Boy's IHSA Sectional Track and Field Meet Thursday, May 17, 2012 in Rockton. Matias took second place in the event with a time of 15.41 seconds. Mike Greene - mgreene@shawmedia.com Huntley's Mike Dollar runs out in front during the second flight of the 4x100-meter relay finals at the Boy's IHSA Sectional Track and Field Meet Thursday, May 17, 2012 in Rockton. 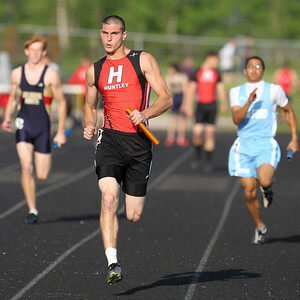 Dollar and Huntley took third place in the event with a time of 43.64 seconds. Mike Greene - mgreene@shawmedia.com Crystal Lake South's Zane Boettcher runs near the finish line ahead of Jacobs' Dom Blake during the 100-meter dash finals at the Boy's IHSA Sectional Track and Field Meet Thursday, May 17, 2012 in Rockton. Boettcher took fourth place in the event with a time of 11.18 seconds. Blake took sixth place with a time of 11.47 seconds.